Katie Ivens, Education Director of Real Action, tells us more about their charity, which we are pleased to support with book donations. 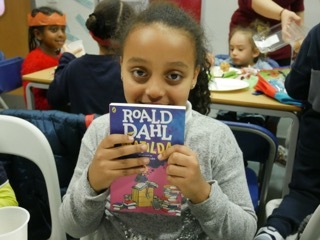 “Real Action, our twenty-year-old educational charity, supports the aims of the Give a Book charity at a profound level. Literature! This is what our children, from every conceivable background, need. And what do they need to get into literature? Literacy. Give a Book gives books. Real Action gives literacy. What prompted the foundation of our charity – in the context of the ‘Estate Action’ underway in what was then known as ‘Crack City’ – was a discovery: the boy gang members were illiterate. The Mozart Estate, which they sought to dominate, had the country’s highest level of child deprivation. Thirty Mozart children attended a thirty-hour summer Butterfly literacy programme given by Butterfly Book author Irina Tyk and her husband, George Tyk. Their reading ages shot up by an average thirty months. The amazing programme was televised, and given a special showing at Number Ten Downing Street. And how did the children’s parents react? ‘What we want is Real Action!’ they said, as they helped found our charity. Our two-hour term-time Butterfly Saturday reading classes started in September 1999. They have not ceased. Located at three sites they target children from deprived communities that surround us. We don’t advertise them: we don’t target parents who read advertisements. Over four hundred 4-12 year-olds come flocking to them each year – largely by the children’s word of mouth. Over two hundred and fifty each year are newcomers. Each child is pre-tested individually and placed in a class that matches reading age, not calendar age. They are seated in ordered rows and taught, directly, by our wonderful volunteers whom we recruit and train. They are taught their scripted, pacey, Butterfly literacy lessons didactically, interactively – and to great effect. They are post-tested. The norm is an average reading age rise of one year in just twenty hours’ animated Butterfly teaching. Up through the classes they fly. Our 2011 longitudinal study, Learning to Read, Reading to Learn, told us that our early millennial pupils did twice as well in their national tests as children who got stuck on our waiting list. We know anecdotally – often from their gangster fathers – that many went on to university; they ditched the street life. We started taking our programme into schools. In 2012 and 2013 we found in the six secondary schools we entered that more than seventy per cent of their eleven-plus newcomers had reading ages below reading age ten; many could not read three-letter words. They had evidently not been taught. Eighteen hours of our Butterfly teaching got their reading ages up by an average eighteen months. Our subsequent work in primary schools has taught us something else. Not only does their average reading age improvement reflect our norm of a year’s advance in an average twenty hours’ Butterfly teaching. Lots of schoolchildren get labelled ‘disadvantaged’: Free School Meals (FSM), Pupil Premium (PP), English as Additional Language (EAL), Special Educational Needs (SEN), boys -68% of poor readers from deprived families are boys. Our Impact Reports over the last three years tell us that the schools’ ‘disadvantaged’ children in our classes do as well as, or outperform, their more privileged peers. Yes, our Butterfly literacy programme empowers our children from a wide range of cultures, and from the most deprived backgrounds, to get into literature. We consistently break the link between deprivation and educational disadvantage. So what do we do with our wonderful young readers? How do we get them from their speedy mastery of literacy to reading books for pleasure, knowledge, understanding and critical thinking? In Class Four, at reading age eight-plus it’s Irina Tyk’s Butterfly Grammar, and reading aloud, appreciatively and expressively, from something like The Wizard of Oz. And in Class Five, with reading age nine-plus, The Junior Butterfly Reader introduces them to literary extracts, including poems – and comprehension at a high level. So does The Advanced Butterfly Reader. Studying Oscar Wilde’s The Happy Prince and Other Stories commonly follows. Our children have studied Alice – in Wonderland and Through the Looking Glass – and Great Expectations. We get them into history too with more classics: Ernst Gombrich’s Little History of the World, and H.E.Marshall’s Our Island Story. And they sometimes get to interact with authors. 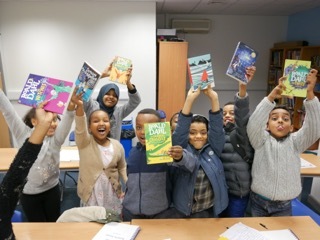 Give a Book supplied tickets to local children from our Butterfly School for a reading by Ben Okri at the Print Room Theatre in Notting Hill as part of their Winter’s Tales season . Hamish Adourian has engaged with our children here too, and at our Queen’s Park Butterfly School. Soon he’s coming to work with our children at our Bevington Saturday classes. Our children will also be in action at the opening event at 11am on the 30th June of the Queen’s Park Book Festival, with the author David Solomons. Thanks to Katie Ivens and Real Action for this post!